Below you will find opportunity to support the missions of ISMA. We are here to help support our membership, spread word of our organization, and keep maritime traditions alive and well on the Great Lakes. Through your contributions we are able to keep moving forward in these manners. 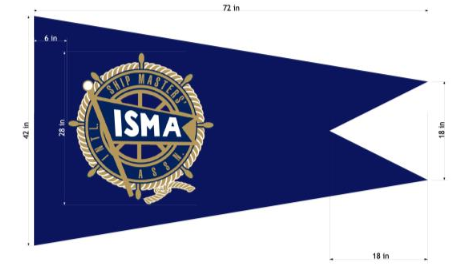 We have been given permission to fly a new ISMA house flag at the Soo Locks thanks to the efforts of Detroit Lodge 7 Secretary and Treasurer Ray Oset. Detroit Lodge 7 flag from their flag manufacturer at a cost of $300.00 and have been able to cover the initial cost of the flag. We are still taking donations for maintenance and back up flag at this time. Any donations to this fund are greatly appreciated as this flag will give us a wealth of exposure to those that visit the Soo Locks and other merchant mariners passing through that might not be familiar with our organization. Feel free to pass the hat at your next lodge meeting or click the donate button to contribute electronically through PayPal.